For a change there's now a recipe from me again. @yuminthetum on Instagram featured this yesterday, which I was really proud of, so I though I'd share this super nutritious smoothie bowl with you all now! Blend everything together so you have a nice and creamy smoothie! The acai is so good for your skin and contains polyphenols that bring out your happiness hormones! Furthermore I contains a lot of healthy fatty acids and omega 3 and 6 which are good for you! I added the beetroot for an even more intense colour and some more protein - the lemon juice nicely covers the beetroot taste. The frozen bananas make your smoothie really thick so you can top it with anything you like. Enjoy as a nutritious breakfast or snack in between! EDIT: Ok, I know it's hard to remake this if you don't have any of the powders mentioned before. But just so you know: You can also use real cooked and blended beetroots or just exchange them to berries, use soy milk and maybe chia seeds for a vegan source of protein and make your life easier this way! I don't want to push anyone into buying anything! I'm so proud to introduce the next girl to take part in #foodiefriendsinlottieskitchen today because I have loved this girl ever since I found her on instagram (that was when I saw her vegan pumpkin caramel blondies on the Banana Bambinos' page) even though she didn't really notice me at first. I was a real fan, cried happy tears over her beautifully colourful pictures and sent her fanmails over blog posts she wrote and can't believe that we have been (snapchat and facebook-) friends for several months now! Eloise is such a gorgeous human being, I can't put it into words. First of all, she is a splendid ballerina, and you have no idea how much I love and adore ballet. Second, she is stunningly beautiful (as you can see!). And third, she is so cool! She has the most amazing ideas when it comes to healthy snack and I wish I could go to Australia to purchase on of her Eat Like Eloise Goodie Boxes! 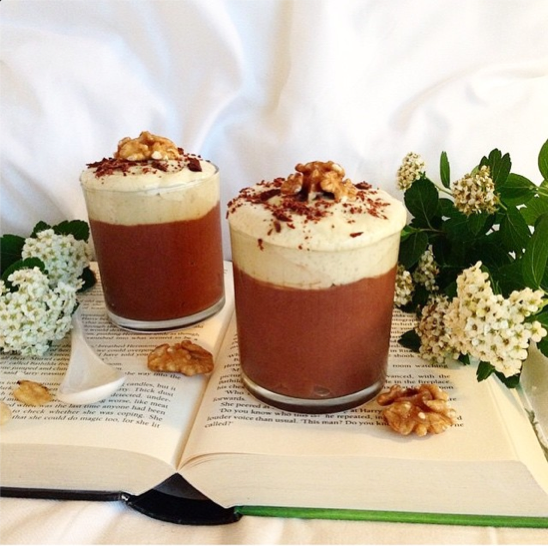 Yes, it's crazy cool, Eloise makes healthy vegan, raw, paleo, gluten-free and sugar-free (phew!) goodies that she sells in and around Melbourne! If you live there I hope you'll hop over to her blog/homepage now and order one! Eloise is amazing at everything she does - if it's ballet, healthy cooking, teaching barre pilates or photographing and I bet she'll be great at Chinese Medicine too which she'll start studying really soon! El, good luck with whatever you do! These cacao vanilla quinoa cakes are perfect for breakfast with fruit and chia pudding, as a snack, or even dessert! 1. In a large bowl, spoon in your spread of choice and pour in the milk. Heat in a microwave or in a saucepan, for 45-60 seconds until relatively hot (but not boiling), mix thoroughly until the spread is not lumpy. Add in banana, apple cider vinegar and vanilla and combine. Stir quinoa in gently. 2. In a separate bowl, combine all dry ingredients (not 2nd bowl ingredients). Add to wet ingredient bowl and combine well. 3. Scoop out half the mixture into a separate bowl (or the bowl the the dry ingredients were in). Add in (2nd bowl) ingredients (cacao powder and nibs). If the mixture is not the same consistency as first bowl, then add milk until both mixtures are the same. The batters will be thick and will be stuck to the spoon. 4. On a lined baking tray, scoop 1 tbsp of the vanilla batter onto the tray (don't pat down), then scoop 1 tbsp of the chocolate batter directly connected and next to the vanilla, so that when cooked, they form as one cake. 5. Cook for 20-30 minutes in the preheated oven (180°C, fan forced!) until firm, and golden and crispy on top. 6. 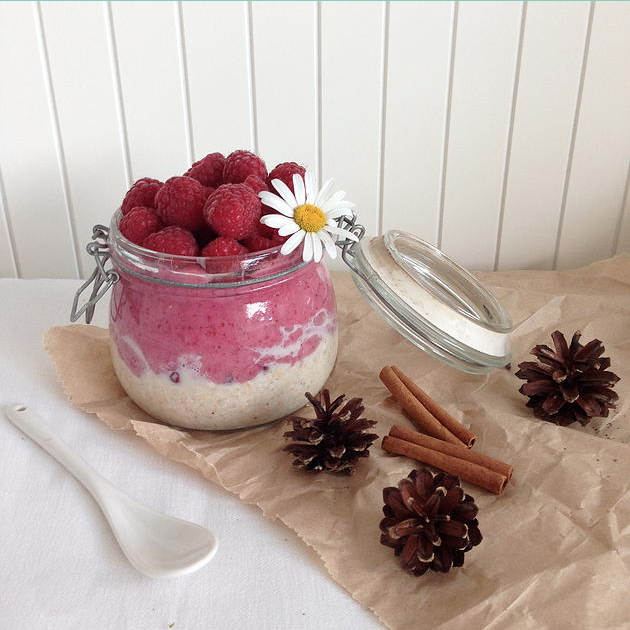 Serve with yoghurt (soy or coconut if vegan), seed or nut spread or your favourite chia pudding recipe. NOTE: I use a vanilla rice protein powder that is sweetened with organic stevia, so I feel no need to add other sweetener, especially with the banana added to the mixture. However, if you taste the batter and feel it is not sweet enough, then feel free to add natural sweetener such as stevia, agave, coconut nectar or rice malt syrup. It's friday which means the pancakes days are almost here! And today I have the honour to be sharing the pancake queen's newest recipe with you guys. 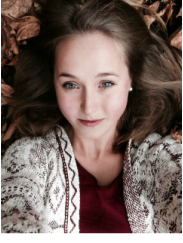 Because the next gorgeous gal to be introduced on my blog is Meghan, a 20 year old girlie from the green sceneries of Wales. You'll all know her from her super huge and amazing instagram account @naturallymeghan and her ﻿﻿blog﻿﻿ is one of those I visit most. 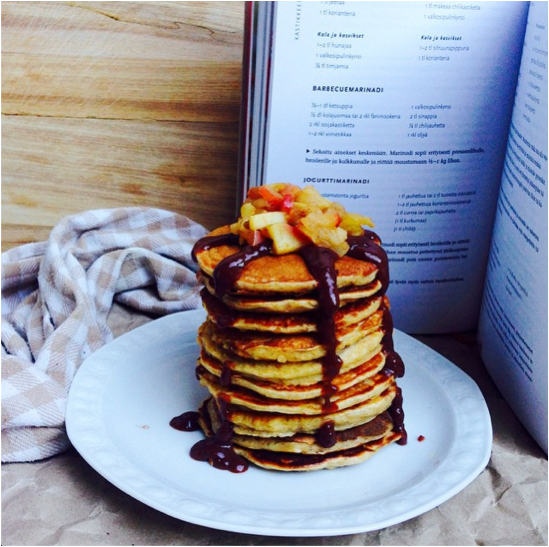 And because she is so famous and talented and all it's a real priviledge for me to be the one to share the recipe for her caramel pancakes here in #foodiefriendsinlottieskitchen! But back to Meghan. As I said, she is super famous already. All kinds of companies contact her for collabs and share her pics. Her sweet, light-coloured and lacey, flowery pictures are all over instagram and I can't stress enough how much I love them. There's so much love in each and every single photo! But furthermore have I had the chance to meet Meghan at one of the plantbased picnics in London and am now a glad girl to call her my friend! Meghan has such a delicate, sweet character! Check out her blog and you'll know what I mean! And before we get to the recipe, of course Meghan too told me what she loves about instagramming and what her favourite foods are. 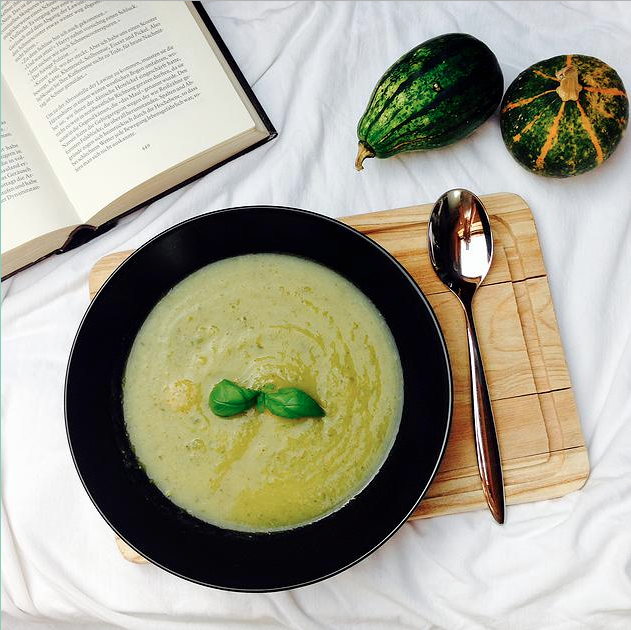 She says: "I instagram becaise I love takeing the time to present my food nicely and I enjoy sharing it with people who have the same interest in health an nutrition as I do; I also like showing people that eating healthily isn't boring or difficult and that blant-based meals are super delicious! As well as the food side of things I also use Instagram as a platform to share my mental health struggles so that others who are battling the same illnesses or difficulties don't feel alone. Choosing a favourite food is so difficult but it would be either bananas or medjool dates!" Pancakes: 1. Prepare the flax eggs by mixing together the ground flaxseed and water in a cup. Leave the mixture in your fridge for at least 30 minutes to thicken up. 2. Mix together the flour, lucuma powder and baking powder in a large mixing bowl. 3. Mash the banana, then add it into the bowl along with the plant milk and flax eggs. Mix well until the batter is smooth. 4. Heat a small amout of coconut oil (or other of your choice) in a frying pan over a medium heat. Add about 1/4 cup of the batter into the pan and spread it out slightly with a spoon to form a pancake shape. 5. Let it cook for about a minute, until bubbles star forming on top and you can see the sides starting to brown, the flip it over and cook for another minute. 6. Repeat with the rest of the mixture then top you pancakes with anything you want! For the raw chocolate fudge sauce: Mix all the ingredients together, then drizzle over your pancakes and enjoy! 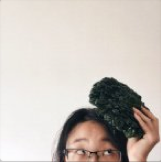 The second young lady to be introduced in my #foodiefriendsinlottieskitchen is Charlie, also known as @chockywoky, a 14-year old girl from Singapore. Yes, she's only 14. And yes, she's one of my favourite foodie friends and so extremly talented, it's crazy. Her pictures are like out of design magazines and she's so good with words (and puns!) that I have no idea where she takes them from. Just read what she says about herself: "She is a writer who enjoys photography, and a photographer who has a deep-seated passion for words." Obscene amount of love - that's the only thing I can say about Charlie! Oh, and she has a blog too - check out Chockywoky! 1. Rinse the buckwheat and combine with liquid and salt in a pot over high heat. 2. When the liquid reaches a boil, turn down to a low heat/ simmer and give it a stir. 3. After 15-20 mins, when all the liquid has been absorbed, turn off the fire and add in the maple syrup. 1. In another pan, lightly toast coconut with cinnamon over low heat until lightly browned. Do this whilst cooking the buckwheat. 2. Warm the milk and maple syrup in a small saucepan if you wish to. 3. Top buckwheat with mango, coconut, kiwi and cacao nibs before pouring on the milk. Enjoy! Life has been treating me well lately. I am full of inspiration and ideas, am currently still doing my Guest Editor week at Finnberry (see post below) and have a new thing coming now! Yes, I am very excited to announce a new project that I'm working on - it's called #foodiefriendsinlottieskitchen and will be a series of my favourite foodie friends creating recipes to be shared in Lottie's little kitchen - that is HERE! Furthermore I'll properly introduce them and tell you about why they instagram and what their favourite foods are. These are the two things that inspire me most about instagram and I'm excited to hear what my foodie friends will say. "My favorite food is vegetable sushi with soy sauce! I absolutely love to go out with my family on special occasions and catch up over chopsticks, green tea, and sushi. My favorites are sweet potato, avocado, and mango! There are a few reasons why I instagram. One very obvious reason is that I LOVE food! I'm a total foodie! 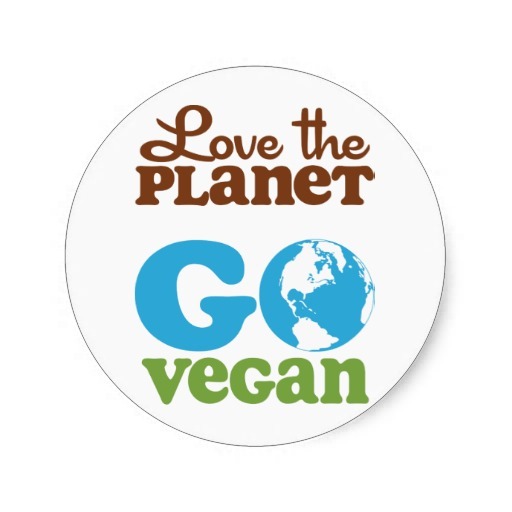 But I love incorporating plant-based foods that have wonderful health benefits into each of my meals. Two, I love photography, and although I am not especially talented and do not have to time to fully dedicate myself to it, I love making my food look beautiful and snapping a picture to share with the world! Three, and most importantly, I instagram to share my story with others. I talk about very personal, often embarrassing aspects of my recovery from Anorexia because those are the things others don't really share, but need to be heard the most. I hope to help people who are lost find their way out by guiding them slowly with my photos and words. My girl Brie is also known as absolut pumpkin fanatic no. 1 and so she of course made something containing those! Yes, she was kind enough to create some absolutely incredible pumkin pie bites with a lot of delicious spices for me and for you guys to remake! I hope you'll love them just as much as I do!" As Brie says, these are a little tricky to make, but totally fun at the same time! Soak your cashews overnight, or at least for 4 or so hours before you begin making your balls. Start off with your crust. Combine the dates combine with the pecans, oats, and cinnamon. Blend on high speed until your mixture is coarse and a little sticky. You can add very little amounts of water if your mixture isn’t blending easily, but the more you add, the sticker they get…so be careful. For the filling combine the pumpkin puree, maple syrup, cashews, vanilla, and cinnamon and blend until smooth. Then spread the crust on a parchmentpaper into a long rectangle. Using a small spoon, put a dollop of filling onto 6 spaces. Using a knife, cut the outline of 6 squares around the filling, and one at a time, start rolling up the corners to close the balls. Roll it in your hands to give it a round shape, and put it on a tray on another piece of parchment paper. Repeat with the rest of the squares, and when you are done, chop some pecans and roll the balls in them for some extra fun! Chill in the freezer for 2 hours, and then enjoy your little snack! Store any extras in a container in the freezer. Thaw for about 5 minutes before eating. Amazing right? I'm off to the supermarket now to buy pumpkins... bye! My motto always changes from Eat the Rainbow to Eat your Greens and today absolutely was a green day. And I promised to give you the recipe for my wholegrain pasta, spinach cream sauce and fried beans so here it is! Cook the spaghetti with a pinch of salt for about 15 minutes. At the same time, cook the plant cream and the fresh spinach leaves in one pot. Cut the onion into small sqares and add them and the vegetable brooth (cube) to the sauce. Cook for about 10 minutes and stir. Fry the beans in a small amout of olive oil until they're hot and then turn off the stove so they stay crunchy! Season both the beans and the sauce with salt and pepper and serve on top of the pasta! Enjoy! Hey peeps and happy new year! 2015 has begun. I'm a little sad as I've returned to Germany and am not at home with my parents and siblings anymore, but this year will bring so many amazing things that I can't wait for time to go by faster! And today is the first of seven amazing days for me - I'll be a new, amazing brand's guest editor on instagram! Finnberry is a finnish company that sells pure natural berry powders and dried berries, which are handpicked in my beloved finnish forests. Check out their homepage and facebook page for more information! And this week I'll be trying out all their products and posting berrylicious dishes on their instagram page. The recipes will be posted on their homepage's recipe section soon after! Stay tuned and give Finnberry a follow so you know what goes on in #lottiesveryberrykitchen! ... and there will be one more surprise for you sooooooooon! This short before Christmas I have to post the BEST recipe there is in this entire world. It's a really old and traditional finnish recipe for a Christmas bread that is served before, on and after Christmas along with all dishes and buttered or with the finnish Christmas ham - but works on it's own or with margarine too. : ) You have my word - this is the softest, most delicious thing in the world! And I'm gonna share the recipe with all of you now so you'll have the chance to serve and enjoy this at your Christmas dinner table! Put malt and dates together and pour the boiling water over them. Let them swell for 20-30 minutes. Add the rest of the ingredients, knead them well until you have a soft dough ball. Put it in the preheated oven (200°C) for 20-30 minutes and enjoy - it's really good served warm! Have you heard of Lottie's famous avo sauce yet? Not? Well, that might be because only I think that I'm famous for it (and maybe my boyfriend too, he has to eat it all the time) because I have it almost every week. Anyways. It's an alteration of a avocado pasta dish that was really famous in Finland a few years ago. Well, actually it was not only famous. Finland went entirely avocado-crazy. Facebook and actually the entire internets was buzzing about a recipe for avocado pasta by Alexander Gullichsen (original recipe here), beginning when it was featured in the biggest newspaper in Finland, "Helsingin Sanomat". The supermarkets put up displays with all the ingredients and at some point they even ran out of pecorino cheese and avocados! So of course I had to try it too - and veganify it (let's make that a word). And simplify it. And lottiefy it. So that's how I came up with "Lottie's famous avo sauce"! And of course Lottie doesn't serve her avo sauce on pasta but on zoodles (noodles made of spiralized zucchinis). Sometimes, when I'm in need of complex carbs (read: when I'm really hungry!) I mix my zoodles with wholegrain spaghetti though, which tastes amazing too! 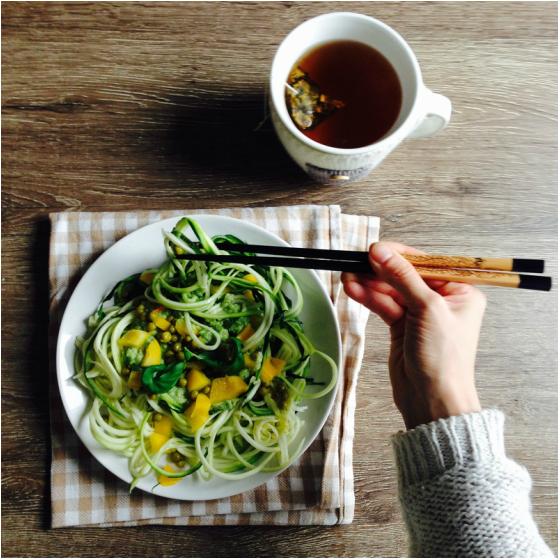 And during wintertime I warm up my zoodles ... but enough now, let's come to the recipe! Spiralize your zucchini and put aside. Slice the flesh of your avocado inside the peel into little cubes and pour them into a bowl then. Add the lemon juice, olive oil, (nutritional yeast) and the warm water and either smash everything with a fork or quickly blend everything together. Chop the garlic and basil leaves into small bits and add them together with the seasonings into the sauce. Top your zoodles with the sauce and mix well. I like to add some veggies on top too, and as mentioned already, you can add some wholegrain/rice noodles or just warm your zoodles up. IF YOU MAKE THIS please please please do tell me because it's my absolute favourite dish and I have to know how you like it! Reminder - get your StripTeas teatox with my discount code now! Hello you lovely thing, are you doing well? I have a suprise for you! I have teamed up with StripTeas and can now offer you a 10% discount on all their teas! StripTeas is a 3-step-teatox plan that will boost your metabolism, increase your energy levels, suppress your appetite and of course detoxify your body - perfect for the festive season! And I swear that this is the yummiest teatox teas I have ever tasted. They taste of spearmint, liquorice, camomile and other yummy herbs and spices - I'd even drink them without the positive effects! Here you can find information about the ingredients and their nutritients. I will also review the teatox after I have drank it for 14 days (but I love it so far!). So now head over to the StripTeas store and remember to use the discount code LOTTIESLITTLE10! What do you grab along, when you leave the house for several hours? To avoid binges, you should always have some healthy packed snack with you. If you don't eat about five times a day, you will be so hungry in the evening that you'll munch everything that gets in your way... that's why snacks are important! And now I have one really yummy and really healthy winterish one for you - and this one tastes so good that it would work well as a side dish to your coffee or tea too! Actually these granola bars make some good healthy christmas cookies too, thanks to the cinnamon and the chocolate they taste really christmassy! Furthermore they are packed with healthy fats and all kinds of fibres (read more here! ), so they are allround good for you! Put water, almond butter and pitted dates into a pot and cook and stir them for one minute. Mash the dates with a fork until the whole mixture has a smooth texture. Then turn off the stove and add the muesli and the oats. Mix everything until you have a thick batter. Spread the batter on a baking paper and put them into the oven at 200°C for about 10 minutes. Meanwhile, melt the chocolate in a pot. Take the muesli mixture out of the oven, cut it into squares, let it cool down for a few minutes and then spread the chocolate onto the bars. Put them into the fridge for a few minutes, and then grab them along when you leave the house or serve with coffee or tea! 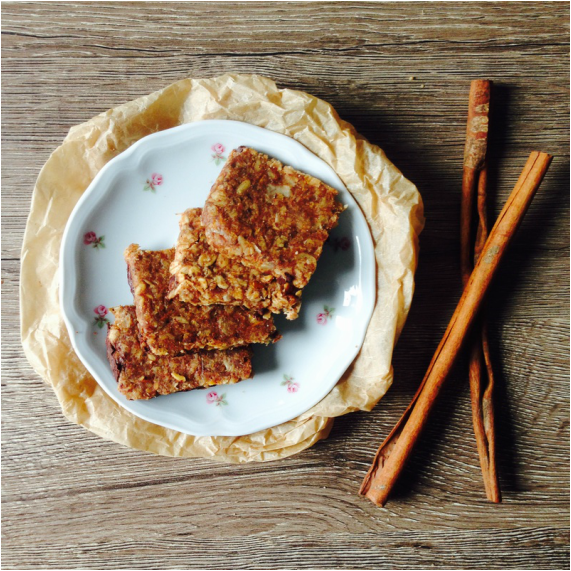 Voila, now you have your perfect, homemade, healthy and filling granola bars! Hey guys! So many of you asked for my little roll recipe on instagram so I proudly present: here it is! And make sure you make them now, because in winter there is nothing better than fresh warm bread out of the hot oven.. Winter time equals baking time, right? Add the ingredients in this order and mix them. Add wholegrain flour until the dough doesn't stick to your fingers anymore (but it still should be soft!). Now you can (if you have time!) let the dough rise, or you already form your little rolls and put them aside then. Make sure that you have enough flour on your hands so the dough doesn't stick to your fingers! You can choose the size of the rolls but I prefer making small ones because they rise faster and you can be sure the inside doesn't stay raw when baking them. Now let the little ones rise in a warm place underneath a dry cloth - this will take about half an hour. Preheat the oven to 180°C. The baking itself will take about another half an hour. You can use a toothpick to see if the inside is still raw (just stick it inside a roll and pull it out and see if dough sticks to the stick!). Enjoy them preferably warm with margarine and a nice salad or (as I did) my lovely green Zucchini / Courgette Soup! Ch-ch-ch-ch-chia! That's what it sounds like when I shake my box filled with chia seeds. I just love them. Chia's positive health effects include boosting energy, stabilizing blood sugar, aiding digestion, and lowering cholesterol and they make an amazing pudding! They only have one con point: Chia seeds are brought here from Argentina, and as a supporter of our planet and always considering environmental issues I prefer local products (such as flax seeds, which are quite alike chia seeds, make a good egg substitute too and are grown everywhere in Europe). Anyways, now we're talking chia. And from time to time you can treat yourself with something "foreign" too, I think. So today after my morning run I made myself this lovely chia parfait. Chia seeds mixed with (plant) milk make a good pudding but I love making my own banana mylk and soaking the chia seeds in there - yum! I layered everything with some mango mousse and it tasted so tropically delicious! Blend the banana with the water and the plant milk and add some sweetener if required. This is now your banana mylk. Add the chia seeds, mix and set aside so the seeds can form a pudding. Now we make the mango mousse, which is really easy as you only have to blend the banana with the half mango - finished! As soon as your chia mix has turned into a pudding you can now layer the pudding and the mousse. This makes a super healthy, super nutritional and fiberlicious parfait! Here you can read more about the health benefits of chia seeds. Oh yes. I am crazy when it comes to Christmas. AND I am crazy when it comes to banana ice cream. So I put those two things together and came up with apple pie nana ice cream! It's so good and chunky and definetly something ice cream shops should sell too ; ). Oh and what's best about this version is that it's completely sugar-free and healthy! Blend the frozen bananas together with the milk. Cut the apple and the date into small chunks (about 1cm x 0,5cm), and cook them together with the water and the cinnamon until they're soft. Now let the fruity mix cool down and then mix them into your nana ice cream. In case you don't like chunks in your soft ice cream, you can now blend everything again. 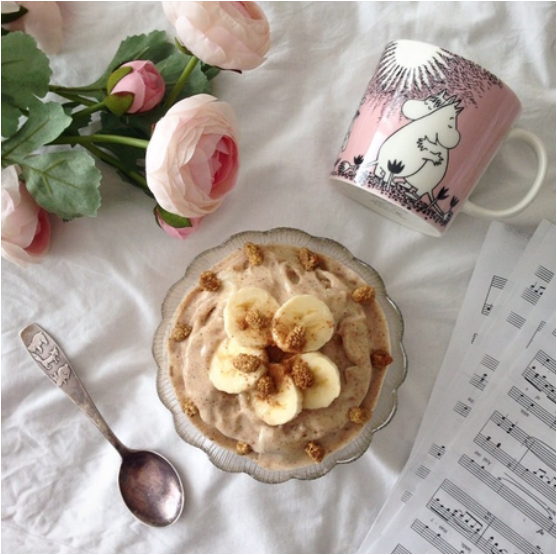 I layered the nana ice cream with a cinnamon-spiced chia pudding and this made a super yummy christmassy and very nutritional breakfast! Jingle bells, jingle bells, jingle all the way... Yippee, I can't believe it's Christmas time already! Right now I'm the happiest girl in the world. Christmas is just the most beautiful time of the year. I was born on the 23rd of December, 51 minutes prior to Christmas and I think that is what has made me a little elf. The finnish word for "elf" ("tonttu") was my first word by the way. And for me there is nothing lovelier than decorating for christmas and COOKING for christmas! Oh, don't you just love the smell of cinnamon and cloves? So today's breakfast had to be christmassy pancakes of course, so I made Gingerbread pancakes! Here comes the recipe - I hope you'll love them as much as I do! Yet again, prepare the chia egg, mix everything, preheat the pan, put big batches of the christmassy batter on the pan and watch the magic happen (but still remember to turn them in time!). Serve with any fruit or sauce - I made a chocolate almond sauce using Primrose's Kitchen Raw Almond and Chia Butter ﻿(because chocolate and christmas just belong, right?). I wish everyone a wonderfully festive season and stay tuned for a lot more Christmas recipes! Okay, I have to admit that I just had a shock. I scrolled through my blog and realized something terrible. Something was missing. My FAVOURITE was missing. Oh my. The best thing ever created: my all-time favourite nana ice cream! Also known as nice cream also known banana ice cream. I am so sorry. But now here it comes! Do you suffer from being a sweet tooth but wanting to live healthily? Do you just loooooove ice cream but don't want to consume diary or sugar? Well, here comes the answer! Banana ice cream has saved my life so often! Bananas are very low in saturated fat, cholesterol and sodium. It is also a good source of dietary fiber (yay for carbs! ), vitamin C and manganese, and a very good source of vitamin B6 - so it's a good recovery meal after doing sports too! Freeze the bananas over night. Then put them into a blender together with the plant milk and the sweetener and blend (a hand blender works very well too!). When the bananas have turned into a smooth, amazing, wonderfully beautiful smooth deliciousness, pour it all into a bowl and enjoy immediatly (or top with cinnamon before that - cinnamon and bananas are a mix made in heaven!). Would you like more nana ice cream recipes - such as peanut butter nana ice cream with raw chocolate sauce, berry nana ice cream or bounty nice cream? If so, stay tuned! ;) Or tell me which recipe you'd like to get first (because I can't tell you which one is the best!)! Oh and a last note about nana ice cream: I absolutely love it. Like LOVE it. You might know that by now. But I feel like I am the only person on instagram who can't have nana ice cream for breakfast, it's awful. But it's just too cold for my tummy! What would autumn and winter time be without apple pie? Oh the feelings! But as nobody can consequently bake (and eat) pies (besides my grandma) I had to come up with a different option to savour my favourite taste mix. And as you might know me as pancake princess (one of my followers gave me that name and I love it!) I of course made apple pie pancakes! Gosh, they're yummy, and I love the little apple chunks in between. Cut the apple into small chunks (0,5 x 1 cm) and cook them in a little water. You can add the cinnamon already. Mix the chia seeds with the water and put aside. Then mix all the other ingredients, add the chia egg and the soft apple chunks. Fry pancakes as per usual on a non-sticking pan with a little vegetable oil. Top with more cooked apple chunks and cinnamon and some chocolate sauce. Voilá, now you have the perfect autumny breakfast! If you had told me a month ago that avocado goes well with chocolate I might have laughed. Because avo is one of my favourite things on earth - smeared on toast together with salt, pepper and chilli. Which again has nothing to do with chocolate! But oh well, I am one adventurous girl (at least in the kitchen, hehe) and as I heard of it I decided to try it. And I guess the avo was what made this mix so heavenly. Because I love bananas and soy yogurt and peanut butter (don't these things already tell that the outcome just has to be amazing?) but I think it is the avo what makes this vegan chocolate pudding the smoothest vegan chocolate pudding ever! Peel and mash the bananas and avocado, add the rest of the ingredients and blend them for a smooth texture. If you want to layer the chocolate pudding cups with a pretty light coloured cream like I did, then leave out the cacao powder at first and put about a cupful aside and use it to top the chocolate pudding with (just remember that this part might change its colour to a creepy dark colour if you store it in the fridge because of the avo and the banana - you know those guys like to change their colour quite quickly). Serve cold! And tell me how you liked it, because I think it's a mix made in heaven! Here comes a breakfast / dessert that has been one of my favourites forever. It reminds me of late summers because that is when lingonberries grow in the finnish forests. Of course you can use any berries or apples or rhubarb for this (or even cacao powder! ), but I like the sourish taste that the lingonberries add to to pudding. Cook the berries in the water for about 10 minutes. Now you have to decide wether you want to sieve out the berries - if you do, the pudding will be fluffier, but I like to keep them as they hold a lot of vitamins. Add the semolina grain, salt and stevia and cook for 5-10 minutes. Then let the pudding cool down (I like to put it outside) until it is at least room temperature. After that whip it up (better use a mixer as it might be quite stiff by now) until its all creamy and fluffy! Enjoy with cold (plant-based) milk! This recipe my mum got from my best friend's mum in kindergarden and I used to beg for her to make this for me when I was little. Now during a cold autumn evening I remembered my old favourite soup and it tasted just as good as ever! Because of the cold weather I added some chilli to warm me up. The perfect dish for cold evenings I'd say! Chop and fry onions and courgettes while boiling the potatoes in 1 litre vegetable brooth. Add courgettes and onions to the potatoes and boil until soft. Blend everything together and season with salt, pepper and chilli (the colder it is outside, the more chilli you should use ;) ). Serve the hot soup with fresh basil and warm bread, turn on some romantic music, light some candles and cuddle into a cozy blanket - there you have the perfect autumny evening! 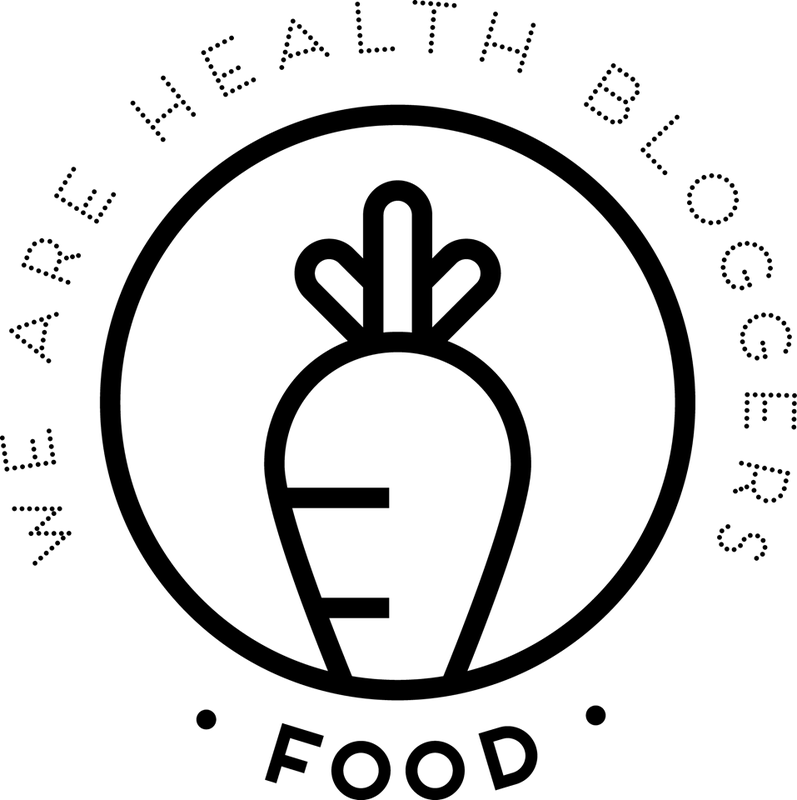 ﻿﻿﻿﻿This is me, the creator of this blog and the healthy food themed instagram account @lottieslittlekitchen. I’m a 22 year old health fanatic girl from Finland - and I’m so happy you have found your way to my little online cookbook. This site will be dedicated to the recipes to the food I post and by doing so I want to show you how easy healthy eating can be - and not only easy, but incredibly delicious too! I call this kind of food "healthy and happy food", because besides being healthy, it makes your environment, your body and your mind happy. If you try out my recipes, I’d be delighted if you told me about it!